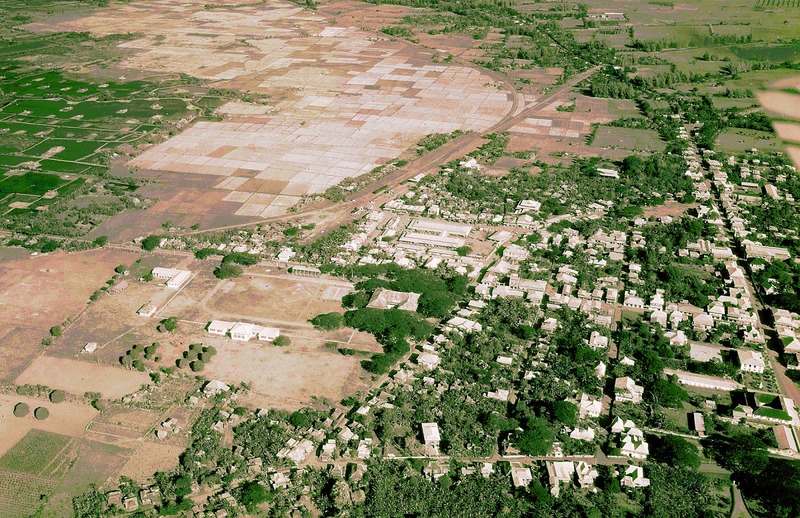 Pre-war aerial photograph of Batangas town. Image source: United States National Archives. 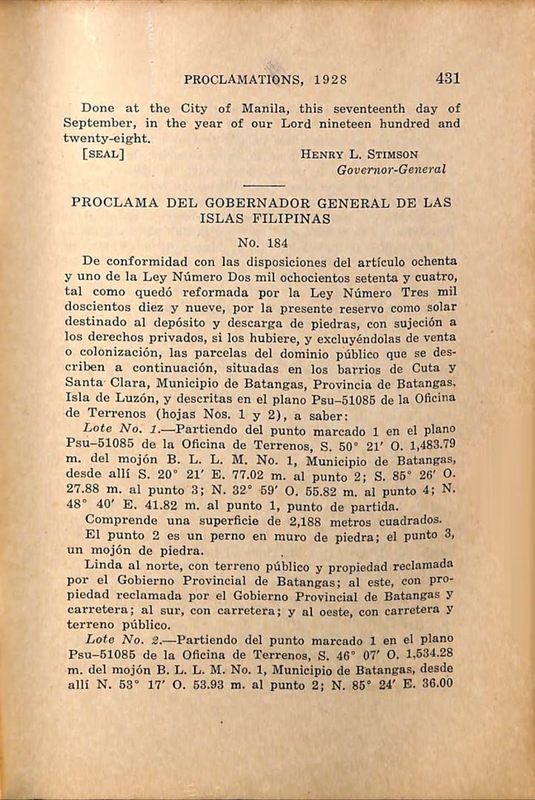 In the year 1928, during the American Colonial Era in the Philippines, a proclamation1 signed by then-Governor General Henry L. Stimson formally reserved parcels of land within the barrios Cuta and Santa Clara in what was then the town of Batangas for use, subject to private rights, in the storing and discharging of stones. The full text of the proclamation are provided below, along with scans of the historic document further down this page. Lot No. 1. 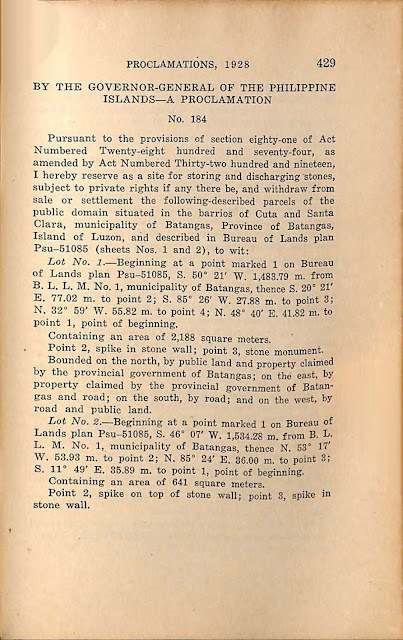 — Beginning at a point marked 1 on Bureau of Lands plan Psu-51085, S. 50° 21' W. 1,483.79 m. from B. L. L. M. No.1, municipality of Batangas, thence S.20° 21' E. 77.02 m. to point 2; S. 85° 26' W. 27.88 m. to point 3; N. 32° 59' W. 55.82 m. to point 4; N. 48° 40' E. 41.82 m. to point 1, point of beginning. Containing an area of 2,188 square meters. Point 2, spike in stone wall; point 3, stone monument. Bounded on the north, by public land and property claimed by the provincial government of Batangas; on the east, by property claimed by the provincial government of Batangas and road; on the south, by road; and on the west, by road and public land. Lot No. 2. — Beginning at a point marked 1 on Bureau of Lands plan Psu-51085, S. 46° 07' W. 1,534.28 m. from B. L.
L. M. No. 1, municipality of Batangas, thence N. 53° 17' W. 53.93 m. to point 2; N. 85° 24' E. 36.00 m. to point 3; S. 11° 49' E. 35.89 m. to point 1, point of beginning. Containing an area of 641 square meters. Point 2, spike on top of stone wall; point 3, spike in stone wall. Bounded on the north, by road; on the east, by public land; on the south, by creek; and on the west, by creek. Lot No. 3. 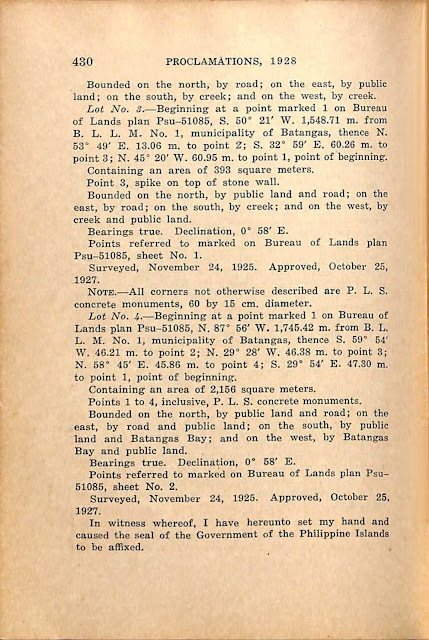 — Beginning at a point marked 1 on Bureau of Lands plan Psu-51085, S. 50° 21' W. 1,548.71 m. from B. L. L. M. No. 1, municipality of Batangas, thence N. 53° 49' E. 13.06 m. to point 2; S. 32° 59' E. 60.26 m. to point 3; N. 45° 20' W. 60.95 m. to point 1, point of beginning. Containing an area of 393 square meters. Point 3, spike on top of stone wall. Bounded on the north, by public land and road; on the east, by road; on the south, by creek; and on the west, by creek and public land. Bearings true. 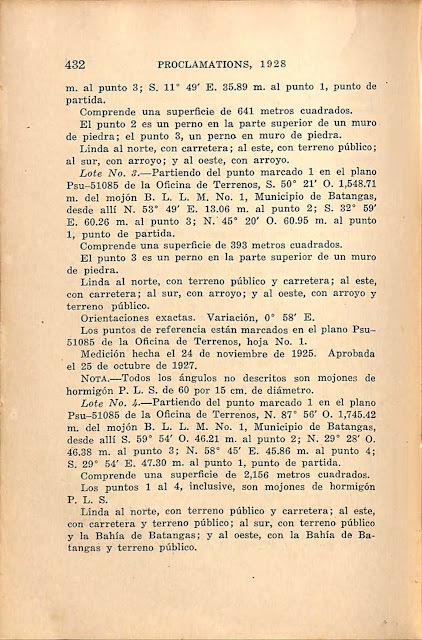 Declination, 0° 58' E.
Points referred to marked on Bureau of Lands plan Psu-51085, sheet No. 1. Surveyed, November 24, 1925. Approved, October 25, 1927. NOTE — All corners not otherwise described are P. L. S. concrete monuments, 60 by 15 cm. diameter. Lot No. 4. — Beginning at a point marked 1 on Bureau of Lands plan Psu-51085, N. 87° 56' W. 1,745.42 m. from B. L.
L. M. No. 1, municipality of Batangas, thence S. 59° 54' W. 46.21 m. to point 2; N. 29° 28' W. 46.38 m. to point 3; N. 58° 45' E. 45.86 m. to point 4; S. 29° 54' E. 47.30 m. to point 1, point of beginning. Containing an area of 2,156 square meters. Points 1 to 4, inclusive, P. L. S. concrete monuments. Bounded on the north, by public land and road; on the east, by road and public land; on the south, by public land and Batangas Bay; and on the west, by Batangas Bay and public land. 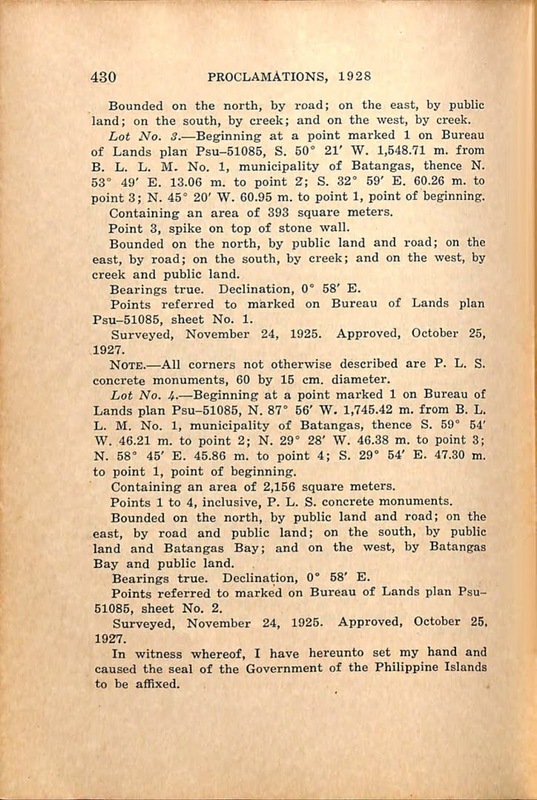 Points referred to marked on Bureau of Lands plan Psu-51086, sheet No. 2. 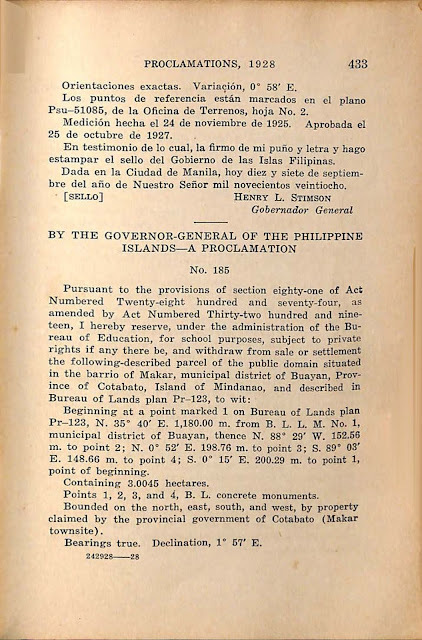 Done at the City of Manila, this seventeenth day of September, in the year of our Lord nineteen hundred and twenty-eight. Proclamation No. 184 s. 1928 English version. Proclamation No. 184 s. 1928 English version, continued. Proclamation No. 184 s. 1928 Spanish version. Proclamation No. 184 s. 1928 Spanish version continued. 1 “Proclamation Nos. 141-206 (1928),” online at the Internet Archive.